Can you see yourself watching whales? And can you picture dolphins speeding through the crystal clear, tropical water a few feet away from your boat? - It is truly an exhilarating experience! 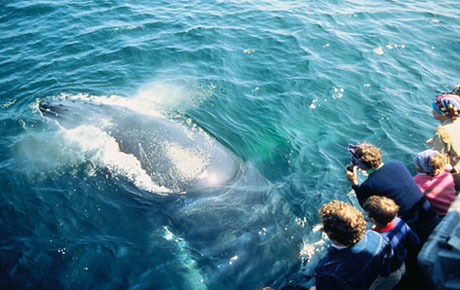 The sight of a huge Humpback slapping the sea with its mighty fluke is a picture of whales you will not soon forget. It is a rare privilege for the relatively few people who ever get to witness this magnificent mammal in its mighty flesh. 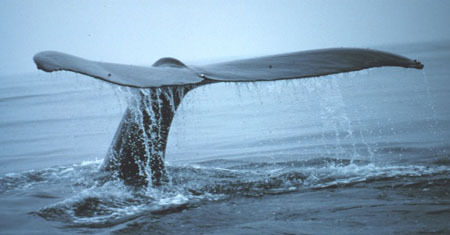 And where can Humpback's frequently be seen and enjoyed in all their 'gigantic' glory? 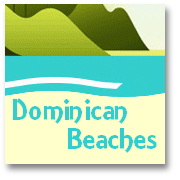 Off the coast of the Dominican Republic, especially in the protected Bay of Samana. But that's not all you might also see Stenella attenuata! That's the Latin name for the Spotted Dolphin (or porpoise as some call it). The 'Spotter', as it is sometimes called, is really a diminuitive, beak nosed, small-toothed whale. Can you picture dolphins leading your boast to the Humpbacks' playground? Here's a SUPERB short video that really helps you imagine what it is like to swim with dolphin from www.bluevoice.org, via google video! It is just great for a '4 minute relaxation' oasis in the middle of the day. Just picture dolphin that make up this beautiful 'pod' of Spotters at play in the Bahia de Samana, on your visit to the Dominican Republic (just click Dolphin Video and when the page loads press the 'start' button - give it a few seconds to load). 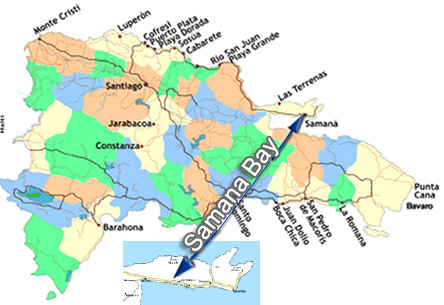 You could be watching dolphins as well as watching whales, too, when you set out on your boat trip from Samana. 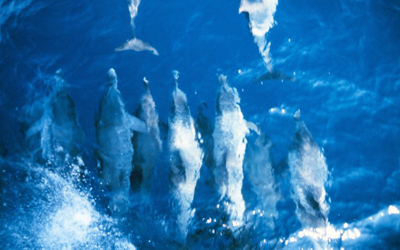 Take a look at our photographs of Spotted Dolphins swimming swiftly in formation ahead of a typical tour boat. Can you picture dolphins leaping ahead of the boat, as if playing 'catch-me-if-you-can'. With luck you will be able to photograph whales and photograph dolphins during the numerous opportunities that often occur on these exciting trips. 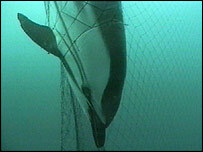 A fully grown spotted dolphin weighs around 105 kg (+or–10kg)/225 lbs (+or–25 lbs) and just under 2½ m/8 feet. A dolphin family group is also called a 'pod', and they tend to live in these small, close communities often working together when feeding, playing and defending themselves from predators. 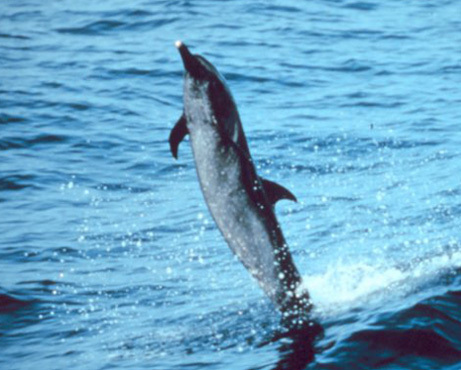 The spotted dolphin, like the humpback whale, is an endangered species. Whilst their natural predators are few – they may be preyed upon by some of the larger species of shark - their biggest threat, once again, is man. Anyone who remembers 'Flipper' will know what sounds a dolphin makes. By emitting a rattle of varying, shrill clicks the dolphin can sense the proximity of friend, foe and food as the 'echoes' of these sounds come back to them, similar to a submarine's sonar system! 'Slender-beaked Dolphins' (as Spotters are also called) are very effective hunters and generally catch fish near the seas surface. They will also eat shrimp, crabs and other crustaceans and squid. So, when is the best time to get the best dolphin pictures, and photograph whales at play ? 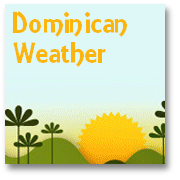 You should take a note that you can only expect to be watching whales during their seasonal winter visit to the warm waters of the Dominican Republic from mid-January to mid-March. Watching dolphins and whales is an unforgettable experience. 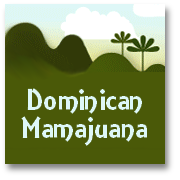 Just one of numerous ecotourism opportunities you will discover whilst visiting the Dominican Republic. 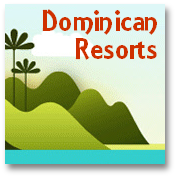 Check back here from time to time as we add more information about ecotourism and activities to make your vacation to the Dominican Republic extra special. In pictures of dolphins you will see that they too have a fluke, or tail fin, which they move up and down to propel themselves through the water. This is a key difference between these 'cetaceans' (as dolphins/whales are called) and fish, which swim by moving their tails from side to side. And how can you arrange an opportunity to be watching whales and perhaps to picture dolphins too, whilst on your vacation in the Dominican Republic? 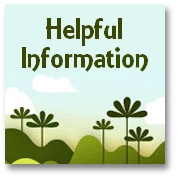 Drop us a line for advice about watching dolphins and whales and we'll be happy to try and help by putting you in touch with reputable and safe operators that respect both their customers and care about these magnificent marine animals.